Just when I think I have it all figured out and running smoothly, I get a big fat slap in the face. Earlier this summer I moved calves out to the front pasture. Although I did a head count from a distance, I never went out there to physically inspect everyone. This past week we moved them back near the house and discovered that the humidity and rain really took a toll on one heifer calf. This is a severe case of rain rot, also known as rain scald, also known as "crap, my poor cow is suffering." Her chest and belly and thighs are all affected, as well as the tips of her ears. She is otherwise healthy and is eating well, but this must be cleared up pronto! The vet instructed us to give her a penicillin shot once a day for three days and to wash her down with iodine. I will also put some aloe vera in her feed to help boost her immune system. Here's hoping she makes a quick recovery...poor thing. 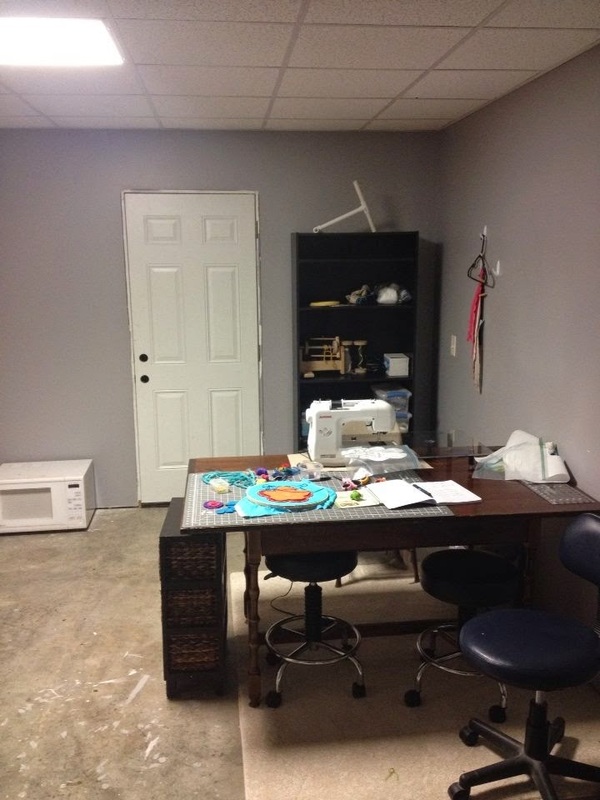 I spent the weekend gathering all of my sewing and spinning items and placing them in a room in the basement. My fiber hobbies were contained within 2 closets, my bedroom and my laundry room. I have a new fiber project (a BIG one) that I am now starting and really needed the space to spread out and work so I took over a spare room in the basement. 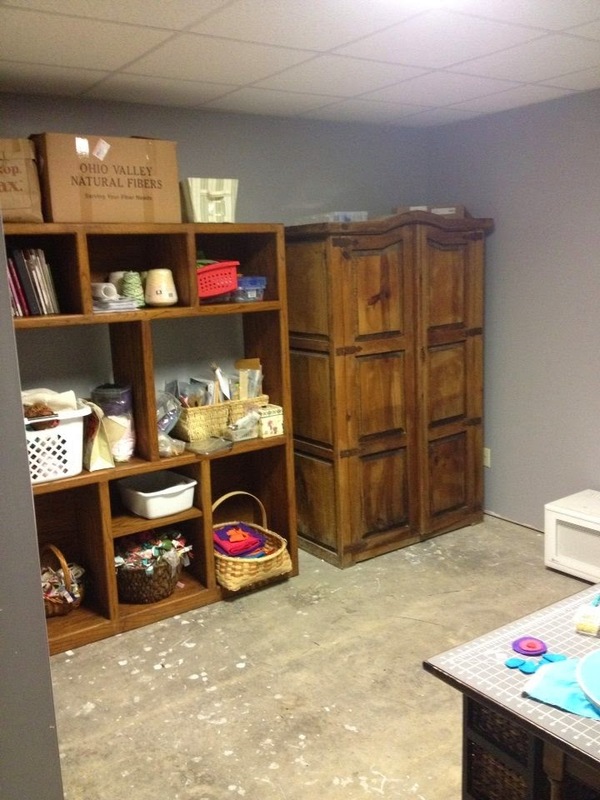 This room was originally going to be a spare bedroom, but it has been nothing but a place to throw "junk". I changed all of that Saturday. Although I still need to organize the stuff now that it is down there, I have ample room for cutting fabric and sewing quilts. I have an empty wall to hang a design board as well. These cabinets and shelves were already in this room serving no purpose so I packed them with books, fabric and yarn. My spinning wheel is within easy reach too! I also found a microwave , from Devin's med school days, that I plan to use for dying fleece and yarn. All I lack now is some organizing, an ironing board and a small table. It was a great motivator to get me to sort through junk and to get things put away too! In a few months I will be ready to share the big project I am working on, but first I have to get busy sewing and planning! We started school back this week, but we are moving at a slow pace. The kids have new math programs that they use on the computer. This week I have been showing them how to load their class and work the program. Next week we will add the rest of the subjects and get back to a real schedule. I like being able to start back at our own speed! I woke up with my jaw hurting badly. Devin think I might have been grinding my teeth in my sleep. The result is my right jaw joint throbbing with pain. I feel like I have been punched in the face. Oh yeah, I am a farmer who thought everything was running smoothly! All of this to say that it hurts to eat and it hurts to talk. So it will be quiet around here while I starve:-) ....or maybe I should make a milkshake run about lunchtime. How is your school year starting out? I'm exited to hear about your new sewing project, can't wait until you reveal all! I'm making lots of things for an online shop that I'm planning on opening any day now. I love sewing and knitting so I've been having the time of my life, I just wish I had as much space as you. I'm having to make do with a trundle table that I put up in the living room when the little ones have gone to bed. I can't wait to see your online shop! make sure you send me the address!!!! Just sending you a hug and some hope things go a little smoother, doesn't help that school prep is a mile high just now either. It is so hard to do everything 'perfect', and I am betting your heart is hurting for your cow, be gentle with yourself, she going to be okay, just in case you are too busy to remember you are an amazing person and very inspiring, and sometimes good enough is more than enough. Best wishes to you and your family.